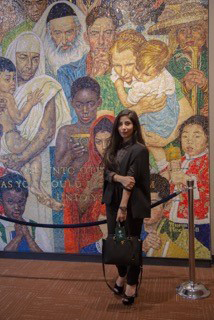 It would be difficult to top the experiences of rising senior Ruba Alblowi who served as an intern at the Permanent Mission of the Kingdom of Saudi Arabia to the United Nations this summer. She was assigned to the Social, Humanitarian, and Cultural Committee, but also worked in other departments including the UN Office of Counter-Terrorism and the Disarmament and International Security Committee. Alblowi had hands-on opportunities to research and talk public policy with a wide variety of important governmental actors. During the internship, she was primary assigned to be with the Mission’s Human Rights and Social Affairs Division. She assisted the permanent mission human rights experts with thematic topics relating to human rights situations in countries such as Syria, Yemen, and Palestine and worked on thematic conferences such as the conferences on the rights of persons with disabilities and the rights of the child. Her general duties included attending meetings at the United Nations and assisting in report writing. In particular, she was active in preparing briefing notes for diplomats and the permanent representatives prior to meetings or negotiations, drafting speeches to be given at the General Assembly and United Nations committee meetings, providing research on existing Saudi Arabia initiatives and partnerships with the UN, in addition to brainstorming and finding creative ways of engagement with the United Nations. The primary tasks of her committee was to oversee issues related to the advancement of women, the protection of children, the treatment of refugees, and the promotion of fundamental freedoms through the elimination of racism and racial discrimination. The committee also addresses important social development issues such as issues related to youth, family, aging, and persons with disabilities. It was a remarkable and full experience for Alblowi. Her rich span of work was a function of the fact that she distinguished herself and thus earned more responsibilities. Her passion for these issues and desire to help influence national and international policy was evident to the people she worked with while overseas. Read more about our undergraduate students.